Thanks for this opportunity to look back and see what you’re up to now Mark. it’s been a long time since your first solo show of club drawings ‘The London Subterraneans’ was held The Garbanzo in Angel Islington in 1985. This recent spate of ink drawings looks back on a life partying and working in street culture and fashion. In the 1980s you were known as the i-D Magazine’s roving reporter writing club gossip and documenting the movers and shakers on the i-D World Tour nights. You’re known as a commentator on social lives. Do you think this is a period work, looking back on a scene? The earliest reportage drawings in the shows are from 1980. The exhibitions feature works created from the 1980s up to the present day. The drawings and paintings chronicle and celebrate underground nightlife from a satirical angle. The works comments on the past 40 years I am drawing from both memory and imagination. The Clubland Chronicles exhibition features a panorama of ink drawings that provide a social commentary on the clubs I have been to from the 70s to the late 90s. The ink drawings are in the British satirical tradition of Hogarth, Gillray and Rowlandson, they contain overheard conversations,babble and chat and attention to detail, lots of clubbers from the 80s and 90s will find themselves in there. Some of the drawings on show were featured in i-d magazine and NME in the 80s and many were recently drawn in 2018/19 clubs featured in the drawings include Wigan Casino, Hacienda,The Dirtbox , The Batcave, the Warehouse at the Electric Ballroom, Kit Kat, Delirium, Shoom, Brain Club, Sunrise, Mud Club, Wag Club, Loveranch, Palladium, Danceteria, Area NYC, P Picasso Club (Tokyo), Boys Own parties . . . In the UK the atmosphere is so tense right now. People are seemingly culturally teetering, uncertain of where we’re going to go, even the certain nature of two-party politics is changing its dialogue? What’s the relevance of the work right now? I am creating images for myself and get told the work is funny and thought provoking. In terms of a contemporary audience for the work I make a living being a full time artist and my paintings, drawings and prints are held in private and public collections around the world. We now live in an age of anxiety and every act including being a full time visual artist is a political act. What was the club scene and how did your work relate to it at the time? In 1986 Andy Warhol came down to the Limelight Club in London, saw the 4 floor mural Yuval Zommer and I had painted, and described it as HOT! He recommended we painted murals at the New York Limelight which we did. Warhol introduced us to the downtown scene Keith Haring, Debbie Harry, Quentin Crisp etc. I took inspiration from the vibrancy of the NYC clubs the melting pot of performance artists, painters, fashion designers, dancers and djs Went clubbing to the Limelight, Area, Palladium, Danceteria, Paradise Garage and the after hours clubs in the East Village such as Save the Robots. 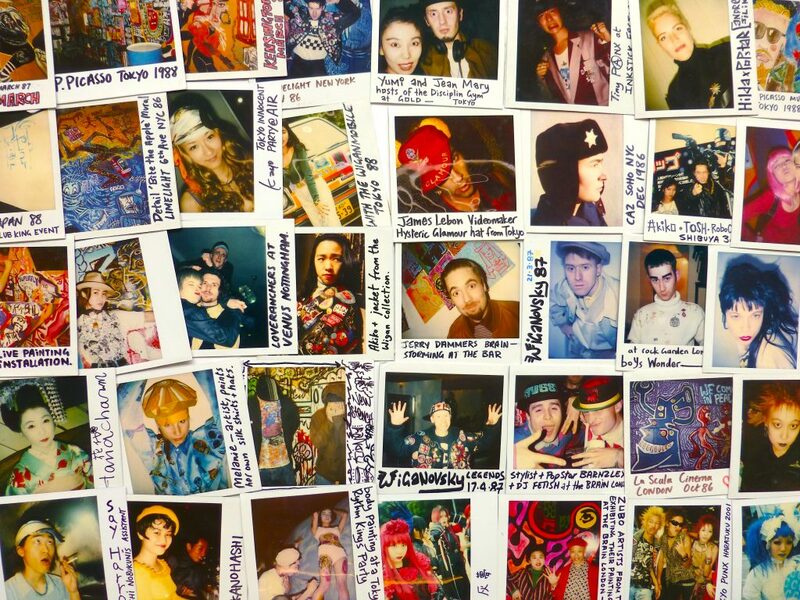 In 1988 I went to Japan for the first time and it was like stepping into Blade Runner I immersed myself in the club culture and painted murals at underground clubs including P.Picasso, End Max and Mix in Tokyo, Buddha Club in Nagoya and live painting performances with VJs and DJs in Kobe and Kyushu. Created set design for Japanese TV shows and art directed and featured in TV commercials. Sold my street/club wear collections in shops across Japan in the late 80s early 90s. During 88/89 The Second Summer of Love, my designs on baggy long sleeve t shirts were worn at all the acid house clubs and raves around the county, in London they were stocked at MASH on Oxford St and Kensington Market, they sold in their thousands. When I went to Japan in 1988 I saw that my illustrations had been bootlegged onto t shirts under the name Mark Logan , so I launched my own streetwear collection in Japan and also created artwork for homeware products including futon covers ,beach towels and pyjamas for department stores in Japan . In 2015/16 I designed a collection for Dr Martens including boots, shoes, backpacks, belts, t shirts. the designs featured my clubscene drawings and sold in shops worlwide. To promote the collection I produced live painting installations and murals at Dr Martens stores in Paris, London,Tokyo, Hong Kong, Singapore, Seoul, Busan, Seattle and Vancouver. More recently I have been creating collaborative collections with menswear and womenswear fashion companies in China, going to Shanghai to create a live painting installation at Yohood 2018 to promote my collection for Fairwhale, Chinas biggest menswear company. Over in Japan I have created a T shirt collection for Duffer of St George Japan and designs for my own Mark Wigan Japan label. How does club or music related ephemera relate to your work as output and as influencing your style? Any other cartoonists or artists you’d like to name as influences and why? From 1983 I designed flyers for warehouse parties and clubs I promoted in London, in 1989/90 flyers and artwork for The Brain Club in Wardour St. From 1984 illustrations and polaroid photography for i-D magazine, also illustrations for New Musical Express, City Limits, Time Out, record sleeves designed for for A Guy Called Gerald, Working Week and Deviant Records and animation for music videos including Oh Well by Oh Well. I continue to work with djs and musicians like Jonas Blue. I designed his logo for his Electronic Nature radio show and a painted backdrop for his residency at Cream in Ibiza in 2018. In 2009 you founded the first and only Museum of Club Culture with Kerry Baldry. Tell us about it. The Museum of Club Culture is another art project it was founded at a warehouse in Hull by my wife, the artist Kerry Baldry and I. In 2009 I was lecturing at Hull School of Art and Design with the intention of chronicling and celebrating club cultures and associated fashion styles and music from around the world from the 1920s to the present day and we began the collection. It has thousands of magazines, flyers, photos and video interviews and we film with clubbers across the generations. 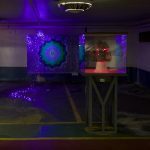 It’s complimented by rotating monthly exhibitions screenings and installations curated by guest curators that focus on different club scenes. Where do you think looking back on the 1980s and 1990s communal music culture is going to go now? Are a generation’s memories destined for archives, TV shows, graphic novels, personal stories, autobiographies as artists look back on times past and assess where we’ve been? What representations do you think that others are up to of particularly interest right now? It’s been 30 years since the birth of the internet and everybody is a curator and archivist now. My archive is unique in that it consists largely of ink drawings that provide a highly personal take on the culture (along with thousands of polaroid portraits) by someone who was very much a participant in the communal music culture.It’s interesting to look back, to take inspiration and contribute to moving culture forward in a positive way while maintaining a highly personal visual language as an artist. Your pictures are crowded and show the intensity of individual performance in the crowd that we associate with the club scene. Are former clubbers going to consume images of this in the gallery with a sophisticated glass of red wine or on the internet, with our slippers? Or is there something more communally vibrant happening for your work right now? The drawings are a direct form of communication they comment and tell stories they appeal to people across the generations not just former clubbers, people can engage with them at galleries in museums on the internet or at music venues. I like to throw a party and the exhibition openings are always followed by late night after parties with DJs playing. 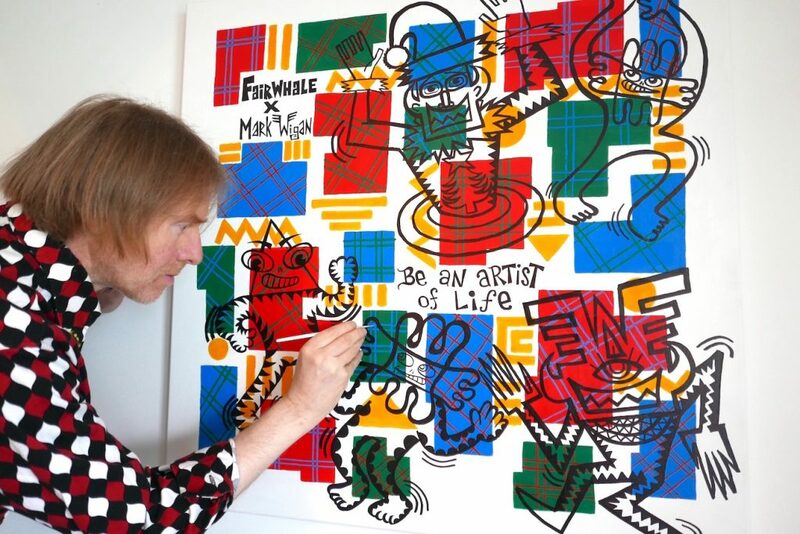 I continue to work on a large scale murals, live painting at Festivals, recently at The World Convention Centre in Shanghai and the next up will be an improvised live painting performance is at The Alfresco Festival in Kent 23 to 27 May. I think people from all walks of life should take this opportunity to appreciate the live art link you’re providing to the immediacy of club culture at its height. Heritage isn’t only country houses or relics of the literary ‘greats’, or shouldn’t be. I appreciate your contemporary archiving as well as your artist contribution to our cultural memory. Thanks again. Bio: Jude Cowan Montague is an artist, poet and archivist. She worked on the Reuters Television Archive for ten years and has published collections of poems about international news stories. She is a composer and performer on electric organs. Her album with Matt Armstrong, Montague Armstrong's, Hammond Hits (2017) is on London experimental label Linear Obsessional. She is an award-winning printmaker writes on visual art for The Quietus and ARTLYST and is the creator and host of Resonance FM show 'The News Agents'. This entry was posted in INTERVIEWS and tagged Mark Wigan. Bookmark the permalink.